Nepal is a landlocked country in Southern Asia, between the Tibet autonomous region of China and India. Its population is approximately 27 million, most of whom live in the south flatlands and central hills of the country. Nepal has a very diverse geography, rising from less than 100 metres (328 ft) elevation in the tropical Terai—the northern rim of the Gangetic Plain, beyond the perpetual snow line to some 90 peaks over 23,000 feet (7,000 m), including Earth’s highest Mount Everest or Sagarmatha at 29,029 ft (8,848m). Hinduism is the predominant religion, but there are also a substantial number of Buddhists, including those from the Tibetan Diaspara. A monarchy for hundreds of years, Nepal was declared a republic in June 2008. Kathmandu is the nation’s capital city, and together with surrounding villages forms Nepal’s the major metropolis. Nepal’s geographic and cultural variations can be divided into three geographic areas: Mountain, Hill and Terai. The southern lowland plains or Terai bordering India are part of the northern rim of the Indo-Gangetic Plain. The Hill Region (Pahad) abuts the mountains and varies from subtropical climates below 4,000 ft (1,200 m) to alpine climates reaching 12,000 ft (3,600 m). The Mountain Region (Himal), situated in the Great Himalayan Range, makes up the northern part of Nepal. It contains 8 of the world’s 10 highest peaks, including Mount Everest – the world’s tallest – on the border with Tibet. WARNING: On April 25th 2015, an earthquake measuring 7.9 on the Richter scale struck Nepal with its epicentre about 50 miles away from Kathmandu. This has been followed by several strong aftershocks. People are asked to help the rescue efforts on the ground in Nepal by donating to the numerous charities and aid organizations that are currently helping with rescue and medical assistance. 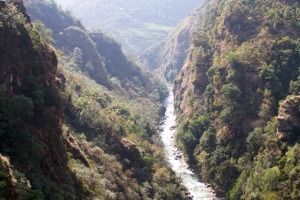 The Bhote Koshi is popular for rafting and kayaking, and is the steepest river rafted in Nepal. Other outdoor adventure activities include bungee jumping and swinging over river. Chitwan National Park is a UNESCO World Heritage Site known for its diverse ecosystems. 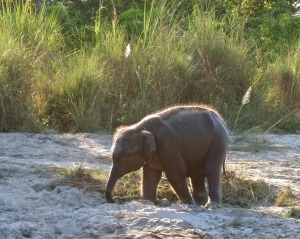 Its unusually rich wildlife includes birds, Asian elephants, Asian rhinos, monkeys, crocodiles, sloth bears, and tigers. The Kathmandu Valley is a World Heritage Site that includes three historic cities: Kathmandu, Bhaktapur, and Patan. It is the starting point for numerous adventures in the rest of the country including trekking, climbing, rafting, wildlife tours, and others. 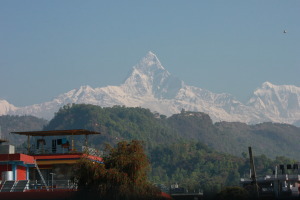 Pokhara, located on Phewa Lake, is the second largest city in Nepal, and the center for diverse outdoor activities. It is the base for many trekkers, including those going to the Annapurna Sanctuary. 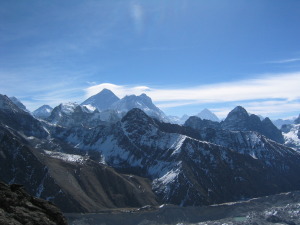 Sagarmatha National Park comprises Mount Everest and other high mountains. It is a UNESCO World Heritage Site, known for its spectacular mountain peaks, friendly Sherpa people, and diverse trekking and climbing opportunities.